I did a search here and found the Unisolar stick on panels. Did not find anything about this style that are on an aluminum substrate. I was thinking, rather than having the clunky heavy flat panels, add some of these with some, say 1/2 sheet type insulation under them. This would protect them from the rivets, add an extra layer of insulation to the roof, and make it smooth and integrated looking. Opinions on the solar panels output etc, and the idea? What would be a good size in term of output that would NOT need a controller, and charge my 2 6v batteries during storage her in CA? If you install solar of any useable amount you will need a controller as you expand the system, especially where you are located. So I would say include in your plan a controller. Those panels look interesting for your application. You could mount them off center and leave a walk/work path at the top of the roof. Where are you getting these panels? I believe these are the same panels that Unisolar did/does offer in a frame also. They have a flexible plastic covering instead of the usual glass. If you are planning anything above 15 or 20 watts I would agree that you should use a controller. Might as well get something in the 20-25 amp range if you are permanently mounting your system you will undoubtedly want to expand on it later. I knew I need a controller for larger panels/wattages, but wondered what the safe cutoff wattage was for a smaller panel for now. If these panels are just the same panels as the roll out ones, maybe I could get those and build onto an aluminum sheet... that way I could totally custom build to suit the shapes and spaces I have. Either way, it would require a lot of planning. I have done a dimensioned plan of the roof, so I know what space I have where. Just do a search on Ebay for "Flexible Solar Panel" and there are a lot of suppliers and diferent sizes. The come is many shapes and wattages. I saw some semi ridged 1/2 foam insulation somewhere, and I thought if I planned carefully, I could have a neat solar instalation that would barely impact the look and aerodynamics, but help with roof insulation too. search ebay for unisolar flexible panels. the company went bankrupt so their panels are cheap. they have glue on the back for full contact to the roof. I picked up four for my trailer. There is a thread on the forum from ddruker that details his install. You should be able to fit a 144watt panel on your moho. The controller can always be changed or added. Just have a plan to where you are going to install it. As close to the batteries as possible. Leave enough wire so you can insert the controller. I used 8/2 marine wire for my longest run from solar to controller. That is probably overkill, but use as big a wire as you can manage in the space allowed. I would be concerned about the exposed insulation breaking down in the sun??? Good idea if you can make it work. You have more sun than me, but I have 40W polycrystaline panels on both the #1 and #3 battery banks without charge controllers. I do have the ability to reinstall the controller on the #1 bank if I was parked in the desert. 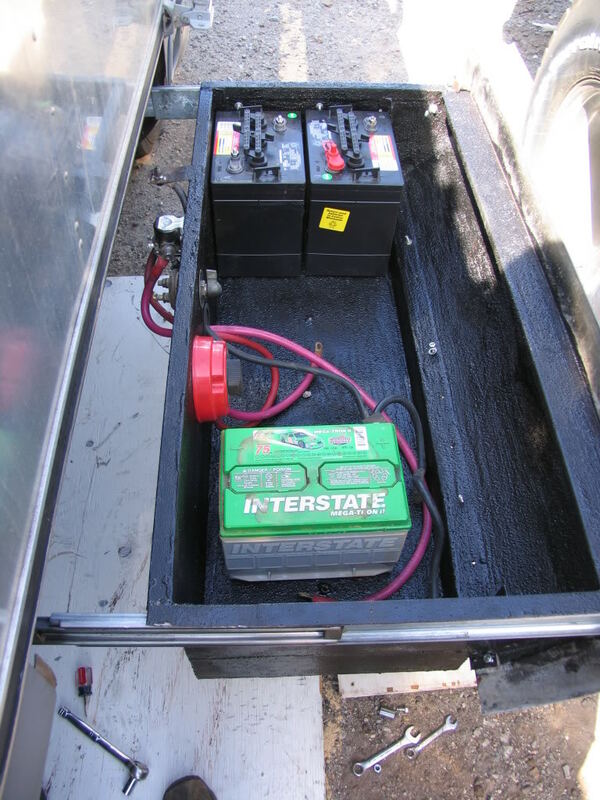 All my batteries can be tied together or separated as needed for solar, or any charging. One other concern with that panel is that it may not have blocking diodes and would then require a controller to avoid backfeed. Most older panels and larger panels had the diodes, but I see some of the newer ones are not equipped with them as they are designed for use with controllers which incude diodes as part of their construction. Diodes can be installed in line, if you needed them. I have very similar flexible panels on my trailer. I bought them from Amazon two years ago with a solar controller. They are both 20 watts and we can now boondocks for several days without worry. Mind you, our trailer is small and the only electrical is lights, water pump and stereo so we don't have a lot of draw. We mounted the panels on the roof but did not adhere them directly to the surface. We used rubber grommets so that there would be a small space under the panel. Then we fastened the panels (through grommets) at the corners and halfway down each length. We wanted to have the spacers to ensure no water got trapped under the panels and so that they could be removed if necessary in the future. We apply a UV protective wax to the top of the panels a couple of times each year to keep them in good shape and to help grime from building up. We couldn't be happier with the panels. I would post pictures but the trailer is all wrapped up in its winter cover right now. Would love to see some pics Alumacoach! My master plan would start with having 4 x 6v Golf cart batteries... I have just 2 now..
Later, by relocating the chassis battery, I have space for 8.. When I buy a controller, it would need to have enough "headroom" to handle adding extra panels and batteries..
Just wondering if you did go ahead with these panels? If yes - report? If no, did you go with something else? - Cheers! I was just down at my dealer in Penticton and was talking to a couple who were picking up their new 25ft and as he was leaving he mentioned he had solar installed.I was curious as I couldn't see the panels and he said they were a new panel made by GPElectric, called Solar Flex,and marketed through Carmanah.It looked like a very clean install and the three panels he had all fit very neatly over the front bedroom.They can apparently be either screwed down,or stuck down with special tape. Has anybody else heard of these or used them yet? • due to the extreme surface heat, the panels tend to cup in a concave fashion ever so slightly, capturing morning dew and the associated dirt....they are extremely hard to clean when this happens. • the biggest problem, which is also heat related, is panel over heating. As solar cells heat, they loose efficiency. With no way to cool down, they can reach surface temperatures of up to 160ºF, which can reduce the output by as much as 50%, making your 100 watt, $600 flex panel essentially a 50 watt, $600 flex panel. That 1000 watt output specification was measured at 'standard test conditions, or STC, which is a lab figure calculated at 77ºF and assuming 1000 watts/sq. meter. Not a real world measurement! •*as stated above, real cost per watt output is still several multiples of flat mono crystalline panels. As I said, when the construction and cooling problems are mitigated, they will be a great panel........JUST NOT YET! Lewster is completely correct in his evaluation. Cooling is a big issue.